Last (half) day where I have to present myself as well (as 3rd of the day). Lloyd introduced an RPA-enabled case mgmt platform that is used in the context of a use case to determine eligibility for Affordable Care Act. Using Sapiens for decisions and Appian for BPM, approximately 4000 people are using this as a work mgmt application (where work is assigned to people so they can work through this). To be able to achieve higher throughput, they however combined this with RPA that emulate the behavoir of the users. He showed (unfortunately in a prerecorded video, not a live demo) how they implemented the robots to perform some of the work (up to 50% of the total work done by the users !). The robots learned how to soft fail if there were issues (in which case the work would go back into the queue), needed to accomodate for latency, etc. Keith presented a way to customize processes to different contexts (for example slightly different regulations / approaches in different countries) by being able to generate a customized process for your specific context (when you start the process). Rather than encoding processes in a procedural manner (after A do B), he is using "service descriptions" to define the tasks and the preconditions. You can then generate a process from this by specifying your goal and context and working backwards to create a customized process from this. This allows you to add new tasks to these processes easily (as this is much more declarative logic and therefore additive). The demo showed a travel application with approval by different people. Service descriptions can have required tasks, required data, etc. The process is generated by working backwards from the goal, adding required steps one by one. Different countries can add their own steps, leading to small customizations in the generated process. I was up next ! I presented on how to combine Process Automation and Machine Learning (ML), to create a platform that combines the benefits of encoding business logic using a combination of business processes, rules etc. but at the same time can become more intelligent over time by observing and learning from the data during execution. The focus was on introducing "non-intrusive" ways of combining processes with ML, to assist users with performing their tasks rather than to try and replace them. Augmenting task data: While human actors are performing tasks in your processes or cases, we can observe the data and try to predict task outcomes based on task inputs. Once the ML algorithm (using Random Forest algorithm, with the SMILE library as the implementation) has been trained a little, it can start augmenting the data with possible predictions, but also with a confidence it has on that prediction, the relative importance of the input parameters, etc. In this case, the manager approving the order would be able to see this augmented data in his task form and use it to make the right decision. Recommending tasks: Case management allows users to add addition dynamic tasks to running cases (even though they weren't modeled in the case upfront) in specific situations. Similarly, these can be monitored and ML could be used to detect patterns. These could be turned into recommendations, where a user is presented with a recommendation to do (or assign) a task based on what the ML algorithm has learned. This can help the users significantly to not forget things or to assist them by preparing most of the work (they simply have to accept the recommendation). Optimizing processes based on ML: One of the advantages of the Random Forest algorithm is that you can inspect the decision trees that are being trained to see what they have learned so far. Since ML also has disadvantages (that it can be biased or that it is simply learning from what is being done, which is not necessarily correct behavior), analyzing what was learned so far and integrating this back into the process (and/or rules etc.) has significant advantages as well. We extended the existing case with additional logic (like for example an additional decision service to determine whether some manager approvals could be automated, or additional ad-hoc tasks included in the case that would be triggered under certain circumstances), so that some of the patterns detected by ML would be encoded and enforced by the case logic itself. These non-introsive ways of combining processes with ML is very complementary (as it allows us to take advantage of both approaches which mitigates some of the disadvantages of ML) and allows users to start getting advantages of ML and build up confidence in small and incremental steps. SAP is presenting "live processes" that are created by combining predefined building blocks, running on their platform with support for conversational user experience, decision management, task inbox, etc. SAP API Business Hub has been extended to also include live processes. Using an employee onboarding scenario, they show how a running instance can be "configured" (only in specific situations, which you can define during authoring) after which you can change the template and generate a new variant. The process visibility workbench allows to generate a customizable UI for monitoring progress of your processes. Next, they show how you can extend the platform by using recipes, which can be imported in SAP web IDE and deployed into the platform, adding additional capabilities that will be available in your live processes from that point forward. Finally, they showed an intelligent assistant that is a sort of chatbot that can respond to voice. It can give an aggregated view of your tasks, complete the tasks through the conversational UI, etc. They showed how the chatbot can be programmed by defining tasks with triggers, requirements and actions, which can then be deployed as a microservice on the SAP cloud. Keith explained the efforts that are going into the DMN TCK, a set of tests to verify the compliance of DMN engines. When running these tests, it takes a large number of models and test cases (currently over a thousand but still growing) and check the results. He explained some of the challenges and opportunities in this context (e.g. error handling). While many vendors claim DMN compatibility, Red Hat is one of the few vendors that actually has the results to prove it ! That concludes bpmNEXT 2019! As previous years, I very much enjoyed the presentations, but probably even more the discussions during the breakouts and evenings. Bonitasoft is explaining how they are containerizing their BPM platform as micro-services and using new technology like serverless. A payroll process with some human interaction. They also simulate a load of 100 users by using some script that runs simultaneously. When they do this, the UI itself becomes unresponsive. After containerizing their application, they use kubernetes to be able to scale up the engine to 3 pods, increasing the capacity what the engine can handle. In a second step, they externalize some of the work that the process is doing as an asynchronous lambda function. This moves some of the CPU usage outside of the BPM platform, making it easier for the engine itself to scale. Signavio is sharing their strategy on combining robots with human actors and how to manage your robotic workforce. They recommend treating robots similar to human resources, by making sure they have clear job descriptions, are evaluated and if necessary fired. Signavio has traditionally offered tools to analyze your existing processes related to performance, which they can for example use to identify tasks that would be appropriate for applying RPA. Once identified, simulation allows you to figure out what the consequences would be of applying robots to perform some of the work. For example, the solution using robots might have a higher cost (for example due to licenses) but decrease cycle time, allowing you to make a conscious decision. Detailed analysis of the performance of the robots once applied could lead to the robot to be fired if it's performing badly. Flowable is using "micro-processes" to manage chatbots and describe their behavior. Around these micro-processes (using BPMN), they use case mgmt (CMMN) to link different chatbots together to make sure they are being used in the right context. In the demo they have different types of chatbots, to assist banking customers with various kinds of functions. In their cases they model "intents" that the chatbot will be trying to detect, and how to respond in case the intent should be executed (using signal events that will trigger a specific process fragment), all context-aware. Using a chatbot conversational UI, you can run through a process, where the chatbot is asking for all the appropriate information step by step by following the process and collecting the results. If necessary it can recommend to switch to a different chatbot or a real human user. The chatbot interface also supports various commands (e.g. /create task ...), and show other relevant information (e.g. open tasks) in the UI. When trying to continue the conversation through WhatsApp (which has the limitation you can only show text, no buttons), the chatbot is smart enough to be aware of those limitations and fall back to text-based replies (e.g. type "yes" or "no") instead of buttons or forms. Nathaniel is launching a panel discussion about the name, moving away from BPM to "Intelligent Automation"? Intelligent might refer more to A.I., automation might refer more to RPA -> taking advantage of some of the hype around these technologies to sell the porfolio. We might be selling BPM technology, but we might be marketing more a vision that is broader than that. That concludes the second day, half a day left tomorrow, where I will be presenting myself. Sandy Kemsley (who is also blogging about the various presentations) is starting off day 2 with a keynote on how large customers are building their own digital automation platforms in house leveraging available technologies, like BPM. Nowadays, taking a best of breed approach is replacing the legacy "monolith". In the last decade, the BPMS became the new monolith because it was trying to fill a gap in app development (with constantly increasing requirements around forms, graphical modeling, BAM, etc.) which lead to large suites including one specific solution for each of these requirements. Agility however is a new competitive differentiator. The new Digital Automation Platform is much more a (dynamic) collection of independent microservices, where the best-of-breed approach allows you to swap services in or out. This might not be the solution for everyone (yet), but might be interesting for small to mid-sized companies looking for a COTS system to manage core processes, or for large companies with a large development team. As a lesson for vendors, she recommends to separate components and price accordingly, and to make sure you can build microservices for your processes and decisions. Trisotech is presenting their business automation as a service offering, allowing business users to express their logic in a simple way and now execute it directly as well. The demo starts with a simple process to turn on the light when a twitter message is received. After defining this simple process within the tool, it's deployed into the cloud with one click, and the lamp he brought on stage starts flashing every time someone tweets #Trisotech. Next, the process is extended to include a sentiment analysis service, to analyze the text included in the tweet, after which the light starts flashing green (or yellow or red) for every positive (or neutral or negative) tweet. Next, a more complex example is used to track customer leads. When going to a demo website, you can register your details and the process will route your request to the right sales person, email you the slides and register you in the CRM system. Trisotech is working closely with Red Hat, so great to see how they have built this great tool to allow people to quickly create and deploy processes and decisions into the cloud. Bruce shares his experience of using Trisotech to model a use case in the mortgage industry, using a combination of BPMN and DMN. Applying for a loan requires quite complex decision models to determine eligibility and determine loan amount etc. The mortgage industry has standardized quite of lot of this, which enables creating some form of reusable service. A DMN model is used to describe the logic, using FEEL for the expressions. While the logic is complex sometimes, the resulting model should still be understandable by domain experts. The data that is used as input is a standardized XML format (Mismo), which is mapped to a more DMN-friendly format (including validation etc.) using a separate process that is deployed as a service as well. Similarly, the input can also be a pdf file in which case a different process is used to extract the data from there. Using a simple test web page to provide the inputs (that is generated as part of the process deployment), the service produces the expected results. Another panel, this time focusing on decision services and A.I. Consensus (at least here it seems) that decision management has great synergy with process automation. In the demo from BP Logix, they show how they have integrated Machine Learning into their Process Director to start using it in combination with processes. In this case we are trying to make a prediction on employee attrition (whether they are likely to leave the company). You start by creating a learner object. After selecting a datasource (a database) and possibly some transformation, you can select which inputs you want to use (giving information or even suggestions on the available data, or visualizing characteristics about the data you selected) and train the model with the selected data. This data can then be used in for example a form to show potential attrition rate while you are filling in information about an employee. Or it can be used in a process to drive a decision. By integrating the learner objects into the Process Director, the learning curve to start using this is much lower, as it's all integrated in one solution (even if the learner objects might actually be encoded by a different actor). Minit suggests to use process mining to improve your RPA strategy. The strategy is two-fold: (1) use it to pick the right process to apply RPA to, select the right activity and person, to get a higher degree of success (as 40% of RPA projects fail); and (2) to monitor the results to make sure everyone is happy. They apply this to a purchase process, where there are various bottlenecks detected to fill in the right order number, etc. (using standard process mining). They allow you to drill down several layers to inspect the details of the selected activity, how for example the human actor is using a combination of the browser, skype, etc., the steps they take (possibly multiple variations) to get the necessary information. These detailed steps could then be used as a basis to generate the RPA script. After applying the RPA robots to automate some of the steps, the same process mining can be used to monitor and compare the results. For example, the average completion time might not have improved as expected, in which case we can analyze why that might be (for example that the bots are creating an increased load on the system, causing performance issues). Finally, Minit dashboards exposes all this information in interactive BI charts. Cognitive Technology is moving from traditional process mining to creating a Digital Twin of your Organization (DTO). This includes process discovery, cost analysis, simulation, etc. but for example also a new feature to derive actual business rules from the data (rather than traditional probabilities). The demo is showing the use case of closing a bank account. They can generate a BPMN diagram from the mining data, but now they even detect correlations for decisions (gateways) using machine learning, to also discover the conditions that are underlying. After verification by a human actor and/or simulation, these conditions can be added to the process. The decision can also be extracted separately using DMN, called from the process model. Finally, simulation can be used to identify possible improvements by applying for example RPA to automate some of the tasks: the simulation engine can generate new data with the suggested improvements, and this data can then be mined again to verify the results. KissFlow is a no-code platform for citizen developers. Neil starts by showing the runtime application first, showing various kinds of forms to start a process, tracking current state, performing work, etc. These forms have various pretty advanced features to load form data, printing, getting assistence, etc. Next, we shifted to the tool to create this. First the forms: composed of various field types like text fields and dropdowns to tables and advanced fields like signatures etc. The process itself is a drag and drop tool but using a quite different visualization that is still a flow chart but tries to be as simple as possible for citizen developers (with inline editing of actions etc. inside the diagram, etc. - which reminded me a lot about Zapier for defining integrations). They are also working on a new KissFlow version 3.0, which will be available soon. The forms and process modeling still look pretty similar, but this new version is adding various features to simplify collaboration, having things like threads where people are collaborating, more adaptive processes, using kanban boards, more extensive reports, etc. Wizly is a tool that allows you to run analysis on collected log data, to do things like compliance checks, correlation checks, relationship and sentiment analysis, etc. The demo shows a call center use case. After loading in the data of about 2000 cases into the tool, the flow model can be generated from the log data and start running analytics. The compliance analysis shows us various information about the paths that are being executed (or not). Next, we can run further analysis, in this case zooming in on problems with bagage-related problems. This allows us to find possible causes (like canceled flights) but also to filter down to get even more insights. DNA analysis detects possible paths and can visualize relations between your data (with the capability to filter further down if necessary). Finally, fourbox plots the data on some form of bubble chart. They were only able to show some of the features, as they explained they have a lot more analytical capabilities under the hood. IBM has worked hard in the last few years to integrate some of their offerings into one unified platform, that they are presenting here. This demo stars with the authoring, where the case builder, process designer and decision center are combined to define the business logic. Next, we switched to the runtime UI where new cases can be started and managed and we run through a few steps of the case. Next they showed some more advanced integrations: a robot is launched to automatically perform one of the steps, interaction with a chatbot to help find the data I need, analysis charts to help with the decision making, etc. The final step is to use Watson AI to make recommendations. Finally, we got a look of the new Business Automation Studio, where you can build business applications in a low-code manner. You can create forms for business users, and these can be linked (by associating actions with the different buttons) to call new pages or backend functions. Back again this year in Santa Barbara for 3 days of discussions on bpmNEXT between (mostly) vendors on what we collectively believe the future might be looking like, or what challenges we face and how we can solve them. And I will be blocking about my impressions of the presentations here. 80% of the user interaction will be done through an interface other than the smart phone (think smart speakers), moving from a worklist metaphor to much more conversational interaction. Since the concept of work is now much broader (including robots, autonomous intelligence, decision services, etc. ), what’s the best way to represent and model this, as traditional flow charts have reached their limits in representing more adaptive requirements. 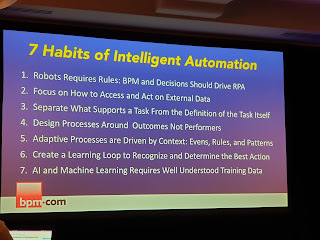 He also made a case for intelligent automation to shift to taking much more short term decisions based on the most recent live events as the business value is typically much higher if the response time is as small as possible and based on the most recent data rather than calculated the best approach long upfront (like how for example Waze can give me a much better route compared to just finding the shortest route long upfront). But we are responsible to make that happen, as “the best way to predict the future is to create it” ! Jim is making a case for open “Digital Business Platforms” where emerging digital technologies can be combined and are at the basis for digital transformation. Quite a few of these exist and could be considered proven solutions but typically only in specific areas (e.g. AI, analytics, BPM, collaboration, cloud or IoT). 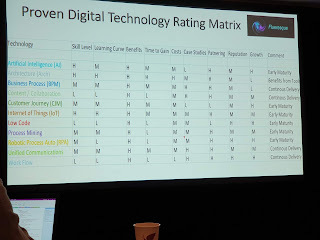 He then described how combining some of these create so-called productive pairs: for example CJM (customer journey mapping) + BPM, or BPM + AI / RPA / PM (process mining) or IoT and AI. Or even triplets: BPM + PM + RPA, BPM + IoT + AI, Arch + Low Code + RPA, Workflow + Content + Collaboration and Unified Communication + AI + BPM. Combining these technologies creates a platform with particularly advantages to achieve certain set of use cases. Jim made a case for vendors to collaborate on this, because some of these technologies can be very complementary and improve customer experience and satisfaction. Next is a panel, with participants from IBM, BonitaSoft and our own Phil Simpson from Red Hat. This is much difficult to summarize, so I'll just aggregate some of the ideas. Do the standards invented decades ago need to evolve to adapt to this new reality? Connection to events is missing? 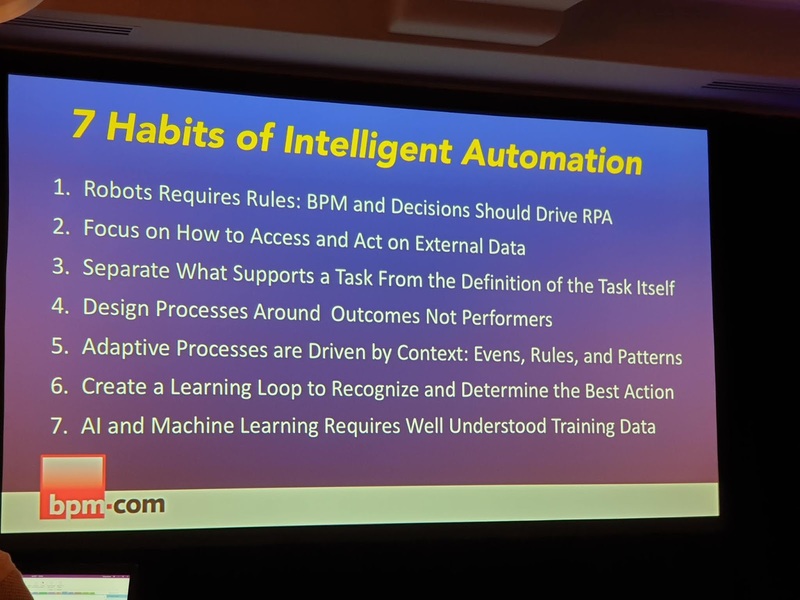 Appian believes that Intelligent Automation needs to be an effort to seamlessly offer RPA, AI, Integration and BPM altogether (rather than isolated silos for each of them). BPM is the glue that brings all of this together, like for example it combines RPA with humans, AI optimized BPM or BPM integrates systems. The demo is showing an invoice processing application that is being enhanced with RPA. After attaching my invoice in the UI, I can send the robot automation desktop where data can be extracted and for example uploaded to an FTP site. BPM can be used to handle for example exceptions during this part (creating new tasks for a human to manually solve). Data from both BPM and RPA also needs to be combined into a holistic view on what is happening. From the authoring point of view, you can set up integrations separately using various connectors (to for example RPA systems but for example also Google NLP) and then use these by calling them from the process. Interesting analogy on why and when RPA: RPA is like ibuprofen where service integration would be like amoxicilline - ibuprofen solves the short term pain and is easily accessible, where amoxicilline is much more difficult to get but solves the issue at the root by killing the infection, there clearly is a market for both. In the next few months, I will have the opportunity to present at both bpmNEXT and Red Hat Summit. Many business processes involve human actors to perform some of the steps that are required to achieve the business goal. In this context, human actors are typically expensive, can cause unwanted delay or become a bottleneck. Automating some of these tasks can have a tremendous return on investment, and Machine Learning brings the missing bits to seamlessly automate work initially assigned to humans as soon as there is enough confidence in the expected outputs. By integrating Machine Learning into our Red Hat Business Automation portfolio, customers can gradually start using Machine Learning to assist or gradually even replace the human actor(s) in a very simple manner, without even having to make any changes to the process definitions in their organisation. Last year, the recordings were available almost immediately, so that should give everyone an opportunity to take advantage of the great presentations that are typically shown there. I will also blog my impressions during the event as last years. I will also attend Red Hat Summit this year, which is taking place in Boston on May 7-9. I have a minitheater session where I will be talking about all the work we have been doing for our next generation architecture for cloud-native business automation. We got a lot of exciting things we've been working on, so I'm really excited we'll be able to share this information with everyone soon. Business automation helps you automate the many processes and decisions in your applications. In the context of a hybrid cloud, we have been working on our next generation architecture to support process automation and decision management in a true cloud-native manner, taking full advantage of the cloud infrastructure and many of the recent technical advances in that context. We will demonstrate how business automation simplifies building your own domain-specific applications, leveraging extremely small and efficient execution yet still taking advantage of a lot of the capabilities business automation could offer you as well (from managing human interaction, auditing to monitoring and admin operations). If you are attending, feel free to reach out if you want to meet up! But we'll share the same information with the wider community as well of course, so stay tuned !